This summer we went to a family reunion in Wisconsin Dells. It is a great place for family vacations; so we thought we will share our experience with you. We hope our experience will be helpful in planning your family reunion or vacation in the Midwest. The following are lists of places where to stay, local attractions, and places to eat good food. And, of course, we learned some lessons that we will apply next time we visit. We have mentioned those, too. Why We Chose Wisconsin Dells. Wisconsin Dells is super family friendly and you can find entertainment for every age and interest. The town is primarily focused on tourism so there are so many things to see and do. There is The Wisconsin River and Lake Dalton, there are so many water parks, good mid-western food, and gorgeous nature. You can just go outside of your resort and see deer peacefully eating. The majority of our extended family stayed in Bakers Sunset Resort Wisconsin Dells. You can find it on Expedia here. The advantage of the resort is that they have indoor and outdoor swimming pools. The indoor swimming pool has some fun water features (slides and fountains) that all the kids enjoyed, They have a good beach with sand and a dock for small watercraft. The kids loved building sand castles and playing with their little construction trucks on the beach. One of our family members has a pontoon boat that he docked right next to the hotel. Their are suites are big and comfortable. The disadvantage of this place is that they do not have an adequate conference or meeting room. There are a couple common-rooms in the basement, but they disconnect you from the wonderful nature all around. There is another common-room by one of the smaller pools. But, that is on the other side of the hotel from the beach. So, it’s also not the hub a family reunion needs. Most of the time the adults sat on the patio near the beach that way the kids could run from pool to beach to rooms without getting too out-of-sight of the adults. The bedrooms themselves are a bit old and in need for some serious updates. The bedroom room we rented had many stains of water leaks on the ceiling and a bathroom that was un-renovated. Our suite also was on the lower level and so the back room had no windows. This made it feel a bit like a dungeon, but the dark and quiet were great for our toddler’s sleep. He didn’t wake-up with the sun a single time. Can I still recommend the place? Yes. It is relatively affordable and has various room-plans that can suit to different family sizes and incomes. That is important for a family reunion when the family is as far-flung as ours. 2. AirBNB Cabin at Lake Delton. View On AirbnbLake Delton WI, WI Dells Full House Rental. Wisconsin Dells is famous for its themed water parks. We went to Mt. Olympus Water and Theme Park. My toddler loved this park even though mommy was a little shocked by the behavior of many of the people in the toddlers’ pool. The cost was a much better value than almost any other venue we went too. But, they have a very complicated parking situation that favors people who are staying at their resort. Visitors need to drive pretty far away from all the signage and walk much further inside the park to get to the indoor pool (where we wanted to take our little guy to give him a break from the sun). To dry off after wading, we went to their kid-carousels. They were nothing special. 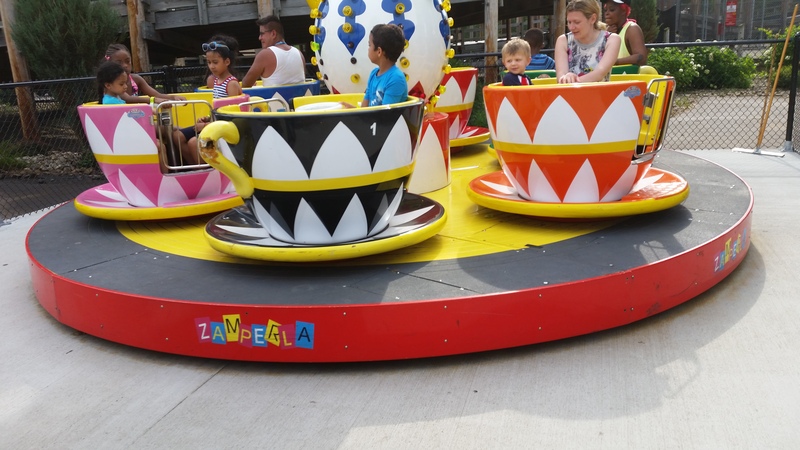 But, our two-year-old still loved every ride, be it in a train or a cup. Several of the family members went to Kalahari resort and reported that it was also very good. I’m pretty sure we will try that one out next-time since the resorts seemed to be an important attraction. 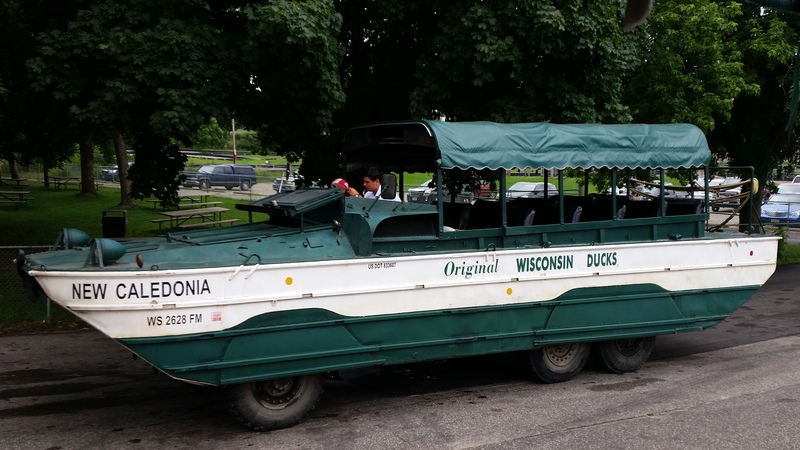 Wisconsin Dells Duck Tour was a perfect reunion event. The amphibious vehicle seated everyone who wanted to go from our family (about 40 people). It drove and boated all around Wisconsin Dells, showing off beautiful nature, rocks, river and lake. The tour guide’s script was about a joke-a-minute and while most of them elicited more groans than laughs, they were well-practiced and kept the trip entertaining. The mechanism for tipping the driver/guide felt more like an exercise in social-engineering than one of generosity. But, our guide earned a good tip. So, I didn’t feel conned. 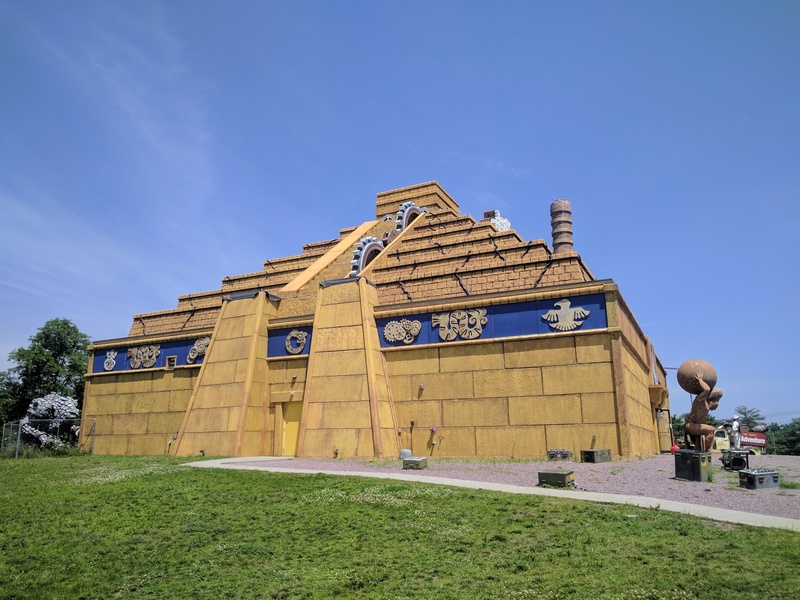 There are many small attractions in Dells such as the “Museum of Historic Torture Devices”, the “Krazy Mirror Maze”, the “Lost Temple” and others. We tried a few of them, but didn’t find them very toddler-friendly or even remotely worth the cost of admission. Perhaps there is an age-range (or intoxication-level) for each of these attractions where the fun is worth the money, but none of us nit the target. On the plus-side most of these attractions are great landmarks and give the town a real vacation-feel. Our toddler never needed an entertainment in the car because the trips were short and the things to see out the windows were fascinating. Buffalo Phil’s Pizza & Grill is a restaurant where food comes to your table on the train!!! That was our favorite family experience in Wisconsin Dells. There is a huge arcade and small amusement park attached to the venue. There was also a dinning hall where we met for the big family meal. Both the event buffet and the ordered food was very good. Sweetie and our toddler even ate onion rings which is pretty unusual. We were both pretty surprised that the SF Bay Area is lacking this kind of place. It is exactly the right kind of geeky+family that is sorely needed, here. We recommend Paul Bunyan’s restaurant to everybody who is around Wisconsin Dells. It serves simple but very excellent American food cooked and served family-style. Geek was skeptical because when we went they were serving ribs which are not his favorite. But, he ended up loving them and everything else that was part of the unending-meal. The theme of Paul Bunyan’s is Midwestern, American folklore. They go all-out with the decorations and even have a giant Paul Bunyan’s statue in front of the restaurant. If you want an event for after-dinner, they also have lumberjack show on the same grounds as the restaurant. Our toddler enjoyed the gift-shop entirely too much. Fortunately, we got away without buying anything. During our 6 days vacation trip, Sweetie went to this place 4 times. It has amazing coffee and a cozy atmosphere. I wish there was something like this close to where I live. If you are there, I fully recommend their Lavender Mint Latte. Their baked goodies were excellent too. They were pretty tolerant of our toddler. But, it’s more trendy than kid-friendly. “Wait”, you say. “McDonalds? Are you just including it because toddlers love chicken nuggets?” Maybe. But, this is probably one of the most interesting McDonald’s we have ever eaten out. Thus, we went there a few times. The food is exactly what you get at every McDonalds. But, the atmosphere was very different from what you would expect. First, it is very big. The ceilings were probably 20 ft high. It looks like a giant log cabin complete with rustic decor, wooden chairs, a fireplace, and carved wooden animals. There’s no play-place. But, this McDonald’s does have a video arcade. We suspect that it would be a great place to stop for some coffee when it’s cold outside. We ate out for all but a handful of meals. So, it was inevitable that we would have a few disappointments. Here they are. This place has pretty good reviews on Yelp but we were not impressed. They serve hot cheese meals in pots. But, they only have plastic utensils. I don’t think any of our spoons actually melted. But, it kind of killed any “good food” vibe we had. You order by standing in line and have to self-serve your drinks even though the food is delivered. Perhaps this makes sense to the teenagers who made up most of the patrons, but it seemed weird to us. The Mac-and-cheese looked pretty good piping hot and fresh from the oven. But, it actually was about what you would expect if you made it at home. So, it wasn’t even worth the weird vibe. The Mexicali Rose Restaurant was the first restaurant where Sweetie even tried Mexican food, many years ago. She remembered disliking it so much that she didn’t try any again until she moved to California. Now, she’s a big fan of Mexican and often craved it while pregnant. So, we had to visit to see if the food was really sub-par or if it was a culture-shock thing. It turns out that the food is just not that good. It’s even pretty unimpressive compared to other mid-western Mexican restaurants and cannot hold a candle to places that serve it in the Bay Area.